In Michael Greenspan’s directorial debut “Wrecked,” which had its world premiere at the Abu Dhabi Film Festival last week, Adrien Brody eats a worm, ingests an ant, fends off a mountain lion, and climbs up a muddy hill in the middle of the forest. It’s a characteristically committed performance from the Oscar-winning actor, who’s worked with a some of the most renown directors in the industry, including Roman Polanski, Spike Lee, and Wes Anderson. 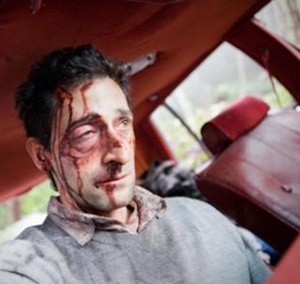 “Wrecked” features Brody in one of his most charged roles to date, as a man who wakes up in the passenger seat of a car wreck with a dead guy in the backseat, no recollection of how he got there, and no sense of who he is. Brody, on hand in Abu Dhabi for the film’s official kick-off, spoke at an intimate press conference following the “Wrecked” premiere. In a surprisingly candid chat, Brody covered an array of topics: he likened his experience of being heavily cut from Terence Malick’s “The Thin Red Line,” to the loss soldiers feel when returning home from war; spoke of his time working with Polanski on “The Pianist;” addressed why he chose to work with a first-time director on “Wrecked;” and even dished about his performance in Woody Allen’s next romantic comedy, “Midnight in Paris.” Below are snippets from his talk. “It was intense but incredibly rewarding in so many ways. It changed my perspective as a human being, and gave me an understanding that I didn’t possess. I look at that moment as the defining moment where I moved into manhood; where I realized in my research and through the insight that Roman inspired in me (by sharing his own personal experiences of lost with me), how much I had taken for granted in my lifetime. “I believed that Michael had the ability to make something special. And I had a blueprint to work with from the script, and in the conversations that Michael and I had. “You can’t just make safe bets. Even directors and actors who do great work, do not always do great work. And I don’t feel like you can wait around until someone of note comes to you and says come work with me. You have to seek out new things that inspire you. “Shooting was a six month experience. That was something that I had gotten against all odds. The character is written as a Midwestern, all American type – which I don’t fit. I had auditioned for several roles, and the one I got was the one coveted role. It was a remarkable experience, and a major life one that taught me a lot. “I love experiencing the uniqueness of every part of the world, and it’s a wonderful opportunity to be here in Abu Dhabi. I’m sharing this experience with my mother for the second time. We had such an amazing time on our first visit. It’s a gift. “You know film festivals are very dear to me. They provide a voice for creative people in my industry. My first ever real notice was from Sundance at a very young age when a journalist made a reference to my work in “Restaurant,” saying that I had a young, raw intensity of a young De Niro or Pacino. In Cannes you know, “The Pianist” was the recipient of the Palme d’or and the screening got a standing ovations of 20 minutes. It brought tears to my eyes. “I can honestly say that much of my own understanding, and my insight, has come from the research I’ve done on characters that are not myself.